Have you heard of vanilla sugar? It’s sugar and vanilla beans mixed together then left alone for a few weeks to infuse. After the process is complete you have a vanilla-y sugar that is perfect for baking, sprinkling on scones or fruit and just about anything else you would use regular sugar for. Well, when I added flavored sugar to my Top 100 list, that is what I intended to make. But then I found this. 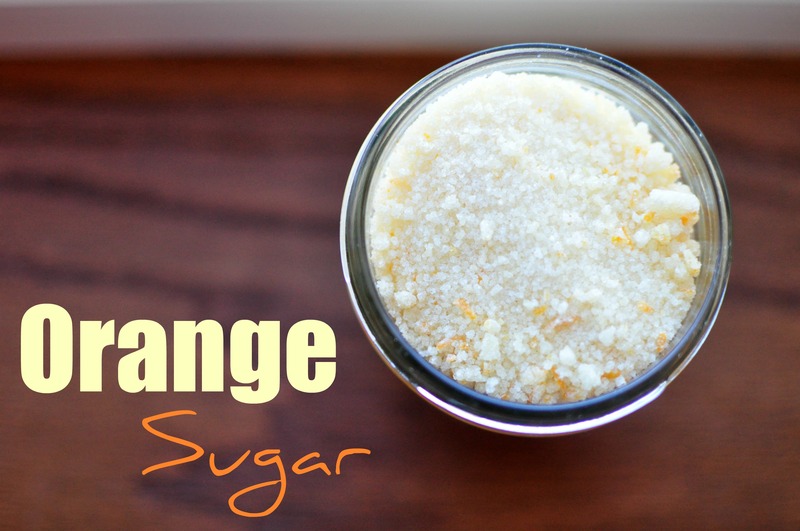 Orange sugar? Seriously!?! It was so quick and easy to make and will last forever! You have to go and make it now because tomorrow’s last 12 Weeks of Christmas Cookie will involve it and let me tell you…you will want to make them! In a small pan over medium heat, simmer orange juice and zest. Cook down until the mixture measure one tablespoon. In a stand mixer, on a medium speed add sugar and a few drops of the orange juice reduction at a time. From here you can get creative. If you want to make sugar cubes for your tea, use molds, ice cube trays or shape into a rectangular disk about a fourth of an inch thick and place on a cookie sheet cutting into cubes and gently spreading out to about two inches apart. I just scattered the sugar on a baking sheet. Bake for at least 15 minutes, stirring or flipping halfway through. Allow to cool completely and store in an airtight container. To use for baking, place in a food processor and pulse until it is fine and now chunks remain.